ArcGIS provides electronic mapping capability for more than 3,000 miles of river and 5,300 navigational markers. The digital charts can be edited in a multiuser GIS environment and data updated as needed. 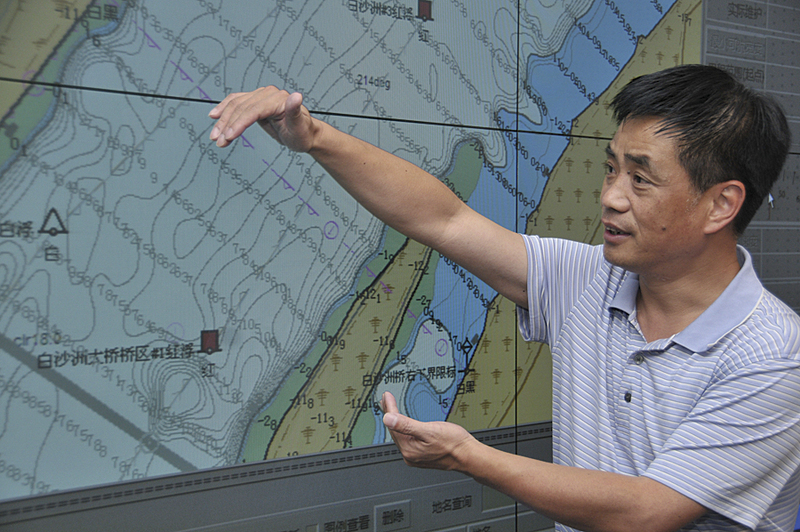 With GIS, disparate data is collected and transformed into China’s national data standard. The Changjiang (or Yangtze) River meanders 3,915 miles through China, from the glaciers in Tibet to the East China Sea. Since opening the river to foreign trade 30 years ago, China’s shipping industry on the Changjiang River has grown by leaps and bounds. In 2011, freight volume exceeded 1.6 billion tons, making it one of the largest and busiest transport rivers in the world. Increasingly, electronic navigation devices are being used instead of paper charts to keep up with the rise in vessels on the waterway. Using ArcGIS, the Changjiang Waterway Bureau charts approximately 5,300 navigating markers, including beacons and buoys, along 3,915 miles of river. The Changjiang River is managed by the Changjiang Waterway Bureau, part of China’s Ministry of Transport. The bureau is responsible for waterway planning, construction, management, conservation, and waterway administration on the river. The bureau’s cartographers and chart makers use ArcGIS to create standardized Electronic Navigation Charts (ENCs). These charts are a vector database of the marine environment, comprising the shape of the coast; the river bottom, including depths; and the location of navigational aids along the river. More than 10,000 people work in the bureau, many charting and mapping hundreds of miles of the river and approximately 5,300 navigating markers, such as beacons and buoys, that allow ships to safely sail. Staff members are spread throughout 77 waterway management departments, ensuring that the data is collected as close to the source as possible, increasing its accuracy. Historically, the bureau had been providing navigational reference services in the form of hard-copy charts. However, ships sailing the Changjiang River are increasingly using modern digital information technology, including electronic navigation devices instead of paper charts, and need more current ENC data. Bureau staff chose ArcGIS because it was the only solution available that could handle the large volumes of disparate geographic data used throughout the organization and distribute information quickly as ENCs. Each local bureau creates and maintains its own data in its own projection using different software. This data, including both topographic and bathymetric data, is shared centrally with the main Changjiang Waterway Bureau in both text and Microsoft Excel data formats. The data is imported into ArcGIS using a customized toolbar that was created for users to transform local coordinates to the standard cartographic and navigational coordinate system. Once in a standard coordinate system, the data is then input into one of two centralized GIS geodatabases for either survey and mapping (terrain data) or ENC (bathymetric data). The Changjiang Waterway Bureau has developed its own local river ENC chart standard—CJ-57—based on the maritime industry’s international S-57 standard. These standards are developed to ensure digital data can be transferred from one system to another without jeopardizing the integrity of the data. Since the GIS data model is based on the industry standard, bureau staff can maintain the local data standard when it is stored in the geodatabase. Le Xu, the ENC production technical leader, explains that the GIS and its extensible data model, objects, and attributes make meeting Changjiang standard characteristics easy, paving the way for the bureau’s ENC production. Staff member for the Changjiang Waterway Bureau reviewing nautical charts. Traditionally, multiple workstations in stand-alone mode were used by bureau cartographers to edit data and export maps and charts individually. This operational workflow has quite a few shortcomings. Many workstations must be used to store data, and the cartographers cannot interact. From a technical perspective, it is difficult to make each individual map sheet and ENC cell match exactly once they are created. All the source data editing and modification is now centralized in the bureau’s geodatabase and shared over the internal network. The end result is the ability to export seamless maps from a single database. Having a centralized geodatabase has also improved the quality of the data and cartography by reducing the inconsistencies that occurred when the maps and cells were edited individually in silos. When a cell or sheet is checked out, the editor will get a local copy of the geodatabase, and no other editor can edit or delete this cell. This ensures there are no conflicts in editing. When the cell is checked back in, other editors can check it out for a second edit, allowing consecutive editing of the data. Inconsistencies that occurred when the maps and cells were edited individually have been reduced significantly. For complex editing, the bureau uses a more sophisticated workflow. Cartography in general is changing rapidly to accommodate the expectations of users. No longer is a single map produced on a paper sheet—today, maps combine foreground information for analysis, as well as a background map to give spatial context. The bureau does this by combining multiple scales for its maps. Sometimes one export file will include two scales. GIS makes managing and editing these different scales manageable using scale band technology. The ENC in Nanjing, for example, has both 1:1,000 and 1:2,000 scales in one file. To modify the scale band, the cartographers use ArcGIS, which prompts them to edit areas of interest at the appropriate scale band. When multiple datasets must be edited at the same time, the map tile or chart cell is first divided into continuous stream segments, or river reaches, in the main geodatabase. Then, each version is divided into different versions: contours and soundings, riverbanks, and other objects. The advantage to this workflow is the ability to modify the data without affecting another editor’s edit. For more information, contact Wen Peng, director, Changjiang Waterway Bureau Survey Center. For more information on how ArcGIS is used at nautical organizations around the world, visit esri.com/nautical.